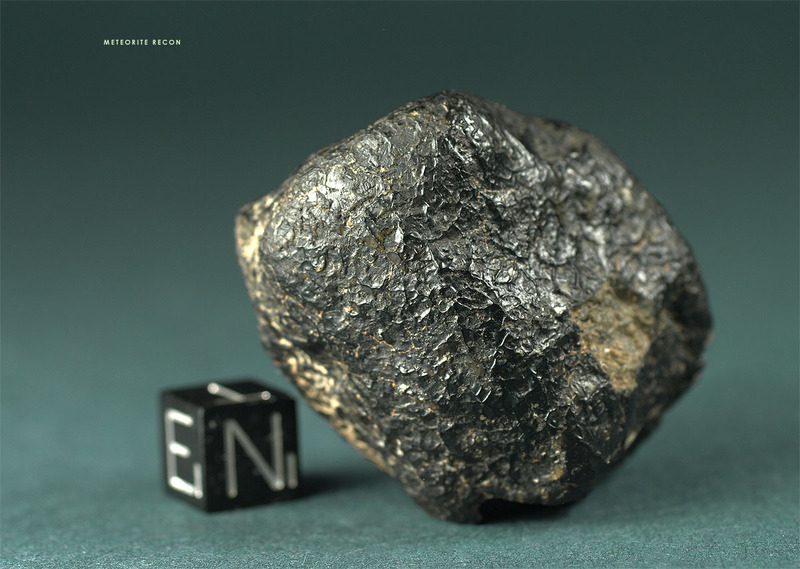 This meteorite was purchased as a “special stone” in February 2009 from a Moroccan mineral dealer. Neither the precise find location nor the name of the finder is known. It was said to be found in the Morrocan Sahara. The meteorite has the size and shape of a fig and shows a glossy black fusion crust as well as a lightly oriented shape with a convex front and a concave rear surface. The dimensions are 4.40 x 3.65 x 2.75 cm, the weight of the stone is 48.0 g.
On two spots the fusion crust is missing, first, on a 7 x 7 mm chip, that probably goes back to the time of the fall as it already shows a darkened matrix coated with forming caliche. The second damage is a missing corner of 14 x 12 mm that was appearently cut out of the meteorite with a hand saw . Beginning light red caliche deposits are marking the meteorite’s lower portion of the broadest surface, which was embedded in a light red soil with clay constituents. The overall appearance of the meteorite is very fresh. 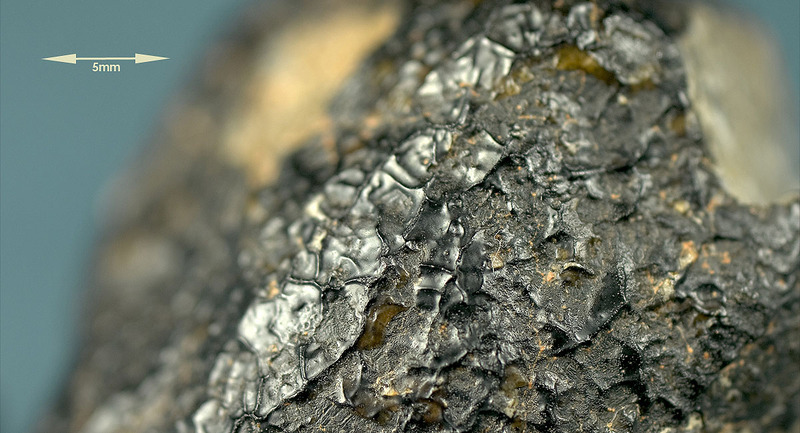 Due to a burred texture composed of delicate spines and ridges the glossy black fresh fusion crust gives the meteorite a crumpled appearence, much like a dried prune. Several patches of the fusion crust show a vesicular structure in the sub milimeter range. Also, Obviously the meteorite is composed of inhomogenous constituents with differing melting points, which lead to a granular and uneven ablation of its surface. The fusion crust displays two noteworthy features. First, glass pockets can be seen solidified in various stages of melting, from clear and transparent to coffee and honey colored and semi opaque to a full opaque glossy black. The second characteristic of the fusion crust is the display of grain boundaries, apparently due to selective ablation of different mineral components. The grain boundaries are visible in the shape of parallel structures reaching lenghts of up to 4 mm. These parallel structures seem to represent underlying coarse grains with barred crystallization patterns. On several spots glass pockets are seperating these grains. As can be seen in the image of the cut section below, the meteorite appears to consist mainly of a pyroxenes and feldspathic glass (originally plagioclase). In fact a large percentage of the matrix shows grains of transparent and semi transparent glass. Under the microscope these glasses often reveal Vesicular pockets with trapped melt inclusions indicating a shock event on the motherbody. One other striking feature of the matrix is the relatively coarse grain size indicating a cooling at a relatively slow rate. Under magnification, the cut section prepared for classification reveals the parallel orientation of the lammellae zoning within the grain structure. As the write up from NWA 5787 in Met.Bull. No. 98 points out, these features bear witness to a strong shock event on the meteorite’s mother body: “The plagioclase consists of multiple domains of subparallel, ribbon-like microcrystals, suggestive of quenching from shock melt (as in some shergottites)”. 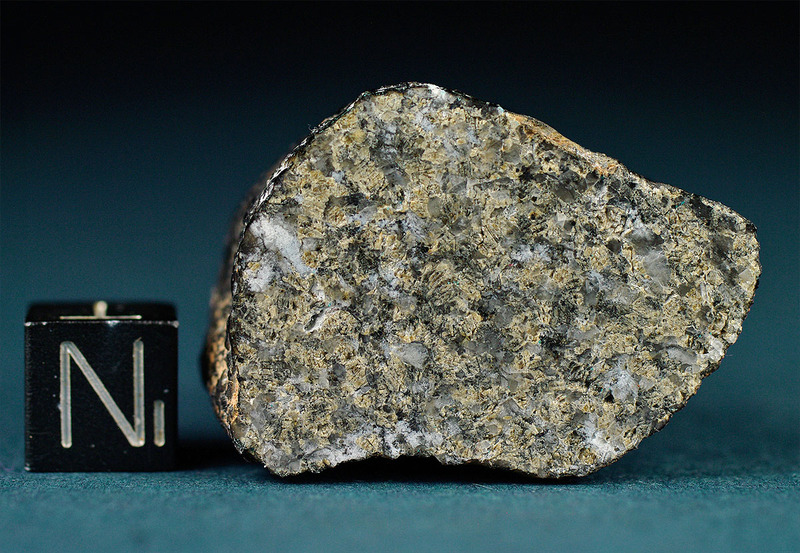 The cut surface detail shown above resembles a rather porous section of the meteorite. Glass grains and parallel lamellae are visible. As can be expected no general orientation of the parallel crystallization pattern is obvious, each barred grain shows a different allignment of its orientation axis.